Ukrainian orbital launch vehicle based on decommissioned R-36M2 intercontinental ballistic missiles. AKA: 15A18M2;Ikar;RS-20K. Status: Active. First Launch: 1999-04-21. Last Launch: 2015-03-25. Number: 22 . Payload: 4,500 kg (9,900 lb). Thrust: 4,525.00 kN (1,017,260 lbf). Gross mass: 208,900 kg (460,500 lb). Height: 34.30 m (112.50 ft). Diameter: 3.00 m (9.80 ft). Span: 3.05 m (10.00 ft). Apogee: 200 km (120 mi). A commercial use was sought for approximately 150 R-36M2 ICBM's which were to be destroyed by 2007 under the START-2 treaty. During the 1990's a variety of civilian versions of the R-36M and R-36M2 were promoted as commercial launchers. Civilian or uprated versions of the MIRV dispenser buses were considered, dubbed Frakht and Lift. Straight use of surplus ICBM's was marketed under the designation RS-20K Konversiya. Under the 'Dnepr' code-name more radical modifications were considered, including converting the missile to a pad-launched booster using liquid oxygen/kerosene propellants. 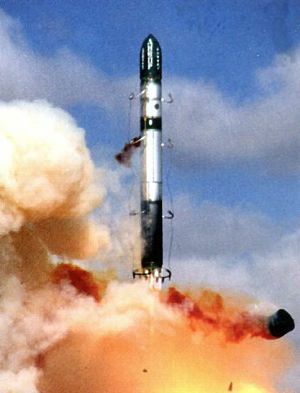 In the end commercial interest was minimal, and the Dnepr designation was used for launches using relatively unmodified surplus R-36M2 military rockets, launched to orbit from silos at Baikonur or ICBM bases in the standard manner. The Dnepr launch vehicle could make timely, highly accurate injection of a single spacecraft or (using the ICBM's multiple warhead dispenser bus) multiple spacecraft with a total mass of up to 3.7 metric tons into low Earth orbits of 300-900 km altitude and 50.5 deg , 64.5 deg , 87.3 deg and 98 deg inclinations. The booster reliability of 97% had been confirmed by 157 test launches of the ICBM over its lifetime. The cold-launch and quick containerized reload features of the ICBM system meant that the existing launch complex could accomplish up to 25 launches per year. Within the standard missile shroud payloads of up to 2.5 m diameter could be accommodated. Injection accuracy to a 300 km circular orbit was 4.0 km in altitude, 3.0 seconds in orbital period, and 0.05 degrees in right ascension. LEO Payload: 4,500 kg (9,900 lb) to a 200 km orbit at 46.20 degrees. Payload: 3,200 kg (7,000 lb) to a 407 km 50.5 deg orbit. Family: ICBM. Country: Ukraine. Engines: RD-264, RD-274, RD-0255, RD-869. Spacecraft: Bugsat, ChubuSat, Deimos 2, EDUSAT, Hodoyoshi, Nanosat, NEXTAR NX-300L, Prisma, RASAT, Satrec, Saudisat 4, SI-300, Sich, SkySat, SSTL-300, Tabletsat Aurora, Toronto GNB, Tsubame, Tsukushi, WNISAT, SSTL-70, MicroSat-100, ROCSAT, MiniSat-400, Megsat, KOMPSAT, Rubin, Saudisat, UniSat, AprizeSat, Cubesat, STSat, Amsat Echo, Demeter, Myriade, MS-1, Kirari, Reimei, CryoSat, Genesis Pathfinder, SaudiComsat, TerraSAR-X, SSTL-150. Launch Sites: Baikonur, Baikonur LC109, Dombarovskiy, Taiyuan LC2. Stages: R-36M2-1, R-36M2-2, R-36M2-3. Agency: Yuzhnoye. 1999 April 21 - . 04:59 GMT - . Launch Site: Baikonur. Launch Complex: Baikonur LC109. Launch Pad: LC109/95. LV Family: R-36M. Launch Vehicle: Dnepr. UoSAT-12 - . Mass: 325 kg (716 lb). Nation: UK. Agency: Surrey. Manufacturer: Surrey. Class: Technology. Type: Navigation technology satellite. Spacecraft: MiniSat-400. USAF Sat Cat: 25693 . COSPAR: 1999-021A. Apogee: 654 km (406 mi). Perigee: 639 km (397 mi). Inclination: 64.60 deg. Period: 97.70 min. First launch of Russia's Dnepr launch vehicle, a converted R-36M2 ICBM. The Dnepr was launched from a silo. The third stage maneuvring bus (used on the ICBM for dispensing multiple warheads) placed UoSAT-12 into a 638 km x 652 km x 64.6 deg orbit. The third stage separated from the payload at 05:13 GMT and then made a burn into a 599 km x 1403 km x 64.6 deg orbit. UoSAT-12 was the first test of the Minibus platform, at 325 kg a larger spacecraft than earlier 50 kg Surrey UoSATs. It carried a mobile radio experiment (MERLION), a GPS receiver, and imaging cameras. Tiungsat-1 - . Payload: MY-Sat 1. Mass: 50 kg (110 lb). Nation: Malaysia. Agency: BKSA. Manufacturer: Surrey. Class: Earth. Type: Earth resources satellite. Spacecraft: SSTL-70. USAF Sat Cat: 26545 . COSPAR: 2000-057A. Apogee: 658 km (409 mi). Perigee: 644 km (400 mi). Inclination: 64.56 deg. Period: 97.67 min. SaudiSat 1B - . Mass: 10 kg (22 lb). Nation: Saudi Arabia. Agency: Makeyev bureau. Manufacturer: KACST. Class: Communications. Type: Civilian communications satellite. Spacecraft: SaudiSat. USAF Sat Cat: 26549 . COSPAR: 2000-057E. Apogee: 664 km (413 mi). Perigee: 644 km (400 mi). Inclination: 64.55 deg. Period: 97.73 min. Saudisat 1A and 1B were developed by the Saudi Institute for Space Research at KACST (King Abdulaziz City for Science and Technology), Riyadh, and carried amateur store-forward communications payloads..
MegSat-1 - . Mass: 50 kg (110 lb). Nation: Italy. Agency: Makeyev bureau. Manufacturer: MegSat. Class: Technology. Type: Navigation technology satellite. Spacecraft: MegSat. USAF Sat Cat: 26546 . COSPAR: 2000-057B. Apogee: 649 km (403 mi). Perigee: 643 km (399 mi). Inclination: 64.56 deg. Period: 97.56 min. Research satellite owned and built by MegSat Space Division, part of the Gruppo Meggiorin companies in Brescia, Italy..
SaudiSat 1A - . Mass: 10 kg (22 lb). Nation: Saudi Arabia. Agency: Makeyev bureau. Manufacturer: KACST. Class: Communications. Type: Civilian communications satellite. Spacecraft: SaudiSat. USAF Sat Cat: 26548 . COSPAR: 2000-057D. Apogee: 651 km (404 mi). Perigee: 644 km (400 mi). Inclination: 64.56 deg. Period: 97.59 min. Saudisat 1A and 1B were developed by the Saudi Institute for Space Research at KACST (King Abdulaziz City for Science and Technology), Riyadh, and carried amateur store-forward communications payloads..
LatinSat 1 - . Payload: AprizeSat 3. Mass: 12 kg (26 lb). Nation: Argentina. Agency: Aprize. Class: Communications. Type: Civilian communications satellite. Spacecraft: AprizeSat. USAF Sat Cat: 27605 . COSPAR: 2002-058A. Apogee: 679 km (421 mi). Perigee: 635 km (394 mi). Inclination: 64.60 deg. Period: 97.90 min. Messaging satellite..
Rubin 2 - . Mass: 45 kg (99 lb). Nation: Germany. Agency: Makeyev bureau. Manufacturer: Bremen. Class: Communications. Type: Civilian communications satellite. Spacecraft: Rubin. USAF Sat Cat: 27609 . COSPAR: 2002-058E. Apogee: 645 km (400 mi). Perigee: 639 km (397 mi). Inclination: 64.60 deg. Period: 97.60 min. Messaging technology satellite..
LatinSat 2 - . Payload: AprizeSat 4. Mass: 12 kg (26 lb). Nation: Argentina. Agency: Aprize. Class: Communications. Type: Civilian communications satellite. Spacecraft: AprizeSat. USAF Sat Cat: 27606 . COSPAR: 2002-058B. Apogee: 702 km (436 mi). Perigee: 632 km (392 mi). Inclination: 64.60 deg. Period: 98.10 min. Messaging satellite..
SaudiSat 1S - . Payload: SaudiSat 2. Mass: 10 kg (22 lb). Nation: Saudi Arabia. Agency: RSRI. Manufacturer: KACST. Class: Technology. Type: Navigation technology satellite. Spacecraft: SaudiSat. USAF Sat Cat: 27607 . COSPAR: 2002-058C. Apogee: 690 km (420 mi). Perigee: 633 km (393 mi). Inclination: 64.60 deg. Period: 98.00 min. Amateur store-forward communications payload..
Aprizesat 2 (LatinSat D) - . Mass: 12 kg (26 lb). Nation: Argentina. Agency: Aprize. Program: AIS. Class: Communications. Type: Civilian store-dump communications satellite. Spacecraft: AprizeSat. USAF Sat Cat: 28366 . COSPAR: 2004-025A. Apogee: 853 km (530 mi). Perigee: 695 km (431 mi). Inclination: 98.30 deg. Period: 100.30 min. Delayed from March. 31. Demeter - . Mass: 125 kg (275 lb). Nation: France. Agency: CNES. Class: Earth. Type: Seismology satellite. Spacecraft Bus: Myriade. Spacecraft: Demeter. USAF Sat Cat: 28368 . COSPAR: 2004-025C. Apogee: 723 km (449 mi). Perigee: 695 km (431 mi). Inclination: 98.30 deg. Period: 99.00 min. Demeter studied disturbances of the ionosphere due to seismo electromagnetic effects and human activities (power lines, VLF transmitters, HF broadcasting stations). Study of natural electromagnetic emissions in the ULF/ELF/VLF range related to seismic or volcanic activity could be used to predict earthquatkes or eruptions in advance. Demeter tracked these emissions and other space plasma parameters (ion composition, electron density and temperature, energetic particles). The scientific payload consisted of three electric and three magnetic sensors (covering six components of the electromagnetic field from DC to 3.5 MHz); a Langmuir probe; an ion spectrometer; and an energetic particle analyzer. 8 Gbits of onboard memory recorded the data, which was returned to earth as 18 Mb/s high bit rate telemetry in the X band. The two-year mission was handled from a control center in Toulouse. Saudicomsat 1 - . Mass: 12 kg (26 lb). Nation: Saudi Arabia. Agency: RSRI. Manufacturer: KACST. Class: Communications. Type: Civilian communications satellite. Spacecraft: SaudiSat. USAF Sat Cat: 28369 . COSPAR: 2004-025D. Apogee: 751 km (466 mi). Perigee: 699 km (434 mi). Inclination: 98.30 deg. Period: 99.30 min. Amateur store-forward communications payload..
Saudicomsat 2 - . Mass: 12 kg (26 lb). Nation: Saudi Arabia. Agency: RSRI. Manufacturer: KACST. Class: Communications. Type: Civilian communications satellite. Spacecraft: SaudiSat. USAF Sat Cat: 28370 . COSPAR: 2004-025E. Apogee: 783 km (486 mi). Perigee: 698 km (433 mi). Inclination: 98.30 deg. Period: 99.60 min. Amateur store-forward communications payload..
Saudisat 2 - . Mass: 35 kg (77 lb). Nation: Saudi Arabia. Agency: RSRI. Manufacturer: KACST. Class: Technology. Type: Navigation technology satellite. Spacecraft: SaudiSat. USAF Sat Cat: 28371 . COSPAR: 2004-025F. Apogee: 736 km (457 mi). Perigee: 698 km (433 mi). Inclination: 98.30 deg. Period: 99.10 min. Experimental technology satellite that included imaging with resolution better than 15 m for remote sensing..
Aprizesat 1 (LatinSat C) - . Mass: 12 kg (26 lb). Nation: Argentina. Agency: Makeyev bureau. Program: AIS. Class: Communications. Type: Civilian store-dump communications satellite. Spacecraft: AprizeSat. USAF Sat Cat: 28372 . COSPAR: 2004-025G. Apogee: 767 km (476 mi). Perigee: 698 km (433 mi). Inclination: 98.30 deg. Period: 99.50 min. Amsat Echo - . Mass: 12 kg (26 lb). Nation: USA. Agency: AmSat. Program: Oscar. Class: Communications. Type: Civilian communications satellite. Spacecraft: Amsat Echo. USAF Sat Cat: 28375 . COSPAR: 2004-025K. Apogee: 818 km (508 mi). Perigee: 697 km (433 mi). Inclination: 98.30 deg. Period: 100.00 min. 2005 August 23 - . 21:10 GMT - . Launch Site: Baikonur. Launch Complex: Baikonur LC109. Launch Pad: LC109/95. LV Family: R-36M. Launch Vehicle: Dnepr. Kirari - . Mass: 570 kg (1,250 lb). Nation: Japan. Agency: JAXA. Manufacturer: Toshiba. Class: Technology. Type: Navigation technology satellite. Spacecraft: Kirari. USAF Sat Cat: 28809 . COSPAR: 2005-031A. Apogee: 614 km (381 mi). Perigee: 596 km (370 mi). Inclination: 97.80 deg. Period: 96.80 min. Moved from J-1A . Delayed from August 15. Optical Inter-Orbit Communications Engineering Test Satellite. Its laser communications experiment was be used in with ESA's Artemis geostationary satellite. The satellite was renamed Kirari (twinkle) after launch. Reimei - . Payload: Index. Mass: 60 kg (132 lb). Nation: Japan. Agency: JAXA. Manufacturer: Mitsubishi. Class: Technology. Type: Navigation technology satellite. Spacecraft: Reimei. USAF Sat Cat: 28810 . COSPAR: 2005-031B. Apogee: 650 km (400 mi). Perigee: 601 km (373 mi). Inclination: 97.80 deg. Period: 97.20 min. Plasma Science Technology. INDEX, renamed Reimei ("Dawn") after launch, was a test satellite with new lightweight satellite components, and a demonstration auroral imager payload..
2006 July 12 - . 14:53 GMT - . Launch Site: Dombarovskiy. LV Family: R-36M. Launch Vehicle: Dnepr. Genesis 1 - . Mass: 1,360 kg (2,990 lb). Nation: USA. Agency: RVSN. Manufacturer: Bigelow. Class: Technology. Type: Navigation technology satellite. Spacecraft Bus: Bigelow. Spacecraft: Genesis Pathfinder. USAF Sat Cat: 29252 . COSPAR: 2006-029A. Apogee: 565 km (351 mi). Perigee: 552 km (342 mi). Inclination: 64.50 deg. Period: 95.80 min. One third scale version of the privately-financed Nautilus inflatable human space habitat module..
2006 July 26 - . 19:43 GMT - . Launch Site: Baikonur. Launch Complex: Baikonur LC109. Launch Pad: LC109/95. LV Family: R-36M. Launch Vehicle: Dnepr. FAILURE: First stage engine failed. Failed Stage: 1. BelKA, Baumanets, Unisat 4, PicPot, and 9 nanosats - . Mass: 360 kg (790 lb). Nation: Belarus. Agency: BNAS. Manufacturer: Korolev bureau. Class: Technology. Type: Navigation technology satellite. Payload consisted of 19 nanosats from academic institutions: BelKA; Baumanets; Unisat-4; PICPOT; ICECube-1; ION; RINCON; AeroCube-1; CalPoly CP1; SEEDS; nCube-1; HAUSAT-1; MEROPE; CalPoly CP2; KUTESat; SACRED; Voyager; ICECube 3. 2007 April 17 - . 06:46 GMT - . Launch Site: Baikonur. Launch Complex: Baikonur LC109. Launch Pad: LC109/95. LV Family: R-36M. Launch Vehicle: Dnepr. MisrSat 1 - . Payload: Egyptsat 1 / MS-1TK. Mass: 100 kg (220 lb). Nation: Egypt. Agency: NARSSS. Manufacturer: Yuzhnoye. Class: Surveillance. Type: Military Radarsat. Spacecraft: MS-1. USAF Sat Cat: 31117 . COSPAR: 2007-012A. Apogee: 667 km (414 mi). Perigee: 657 km (408 mi). Inclination: 98.10 deg. Period: 98.00 min. MisrSat/Egyptsat carried an imaging payload for Egypt's National Authority for Remote Sensing and Space Sciences..
Saudisat 3 - . Mass: 35 kg (77 lb). Nation: Saudi Arabia. Agency: RSRI. Class: Surveillance. Type: Military Radarsat. Spacecraft: Saudisat. USAF Sat Cat: 31118 . COSPAR: 2007-012B. Apogee: 679 km (421 mi). Perigee: 656 km (407 mi). Inclination: 98.10 deg. Period: 98.10 min. Saudisat 3 carried a suveillance instrument, backed by data collection and relay avionics, to work in concert with the five smaller SaudiComSats launched at the same time..
SaudiComsat-3 - . Mass: 12 kg (26 lb). Nation: Saudi Arabia. Agency: RSRI. Class: Communications. Type: Civilian communications satellite. Spacecraft: SaudiComsat. USAF Sat Cat: 31125 . COSPAR: 2007-012J. Apogee: 718 km (446 mi). Perigee: 653 km (405 mi). Inclination: 98.10 deg. Period: 98.50 min. SaudiComsat-4 - . Mass: 12 kg (26 lb). Nation: Saudi Arabia. Agency: RSRI. Class: Communications. Type: Civilian communications satellite. Spacecraft: SaudiComsat. USAF Sat Cat: 31127 . COSPAR: 2007-012L. Apogee: 751 km (466 mi). Perigee: 650 km (400 mi). Inclination: 98.10 deg. Period: 98.80 min. SaudiComsat-5 - . Mass: 12 kg (26 lb). Nation: Saudi Arabia. Agency: RSRI. Class: Communications. Type: Civilian communications satellite. Spacecraft: SaudiComsat. USAF Sat Cat: 31124 . COSPAR: 2007-012H. Apogee: 729 km (452 mi). Perigee: 652 km (405 mi). Inclination: 98.10 deg. Period: 98.60 min. SaudiComsat-6 - . Mass: 12 kg (26 lb). Nation: Saudi Arabia. Agency: RSRI. Class: Communications. Type: Civilian communications satellite. Spacecraft: SaudiComsat. USAF Sat Cat: 31121 . COSPAR: 2007-012E. Apogee: 762 km (473 mi). Perigee: 649 km (403 mi). Inclination: 98.10 deg. Period: 98.90 min. SaudiComsat-7 - . Mass: 12 kg (26 lb). Nation: Saudi Arabia. Agency: RSRI. Class: Communications. Type: Civilian communications satellite. Spacecraft: SaudiComsat. USAF Sat Cat: 31119 . COSPAR: 2007-012C. Apogee: 740 km (450 mi). Perigee: 651 km (404 mi). Inclination: 98.10 deg. Period: 98.70 min. CAPE 1 - . Mass: 1.00 kg (2.20 lb). Nation: USA. Agency: Makeyev bureau. Manufacturer: Louisiana. Class: Technology. Type: Navigation technology satellite. Spacecraft: Cubesat. USAF Sat Cat: 31130 . COSPAR: 2007-012P. Apogee: 793 km (492 mi). Perigee: 646 km (401 mi). Inclination: 98.10 deg. Period: 99.20 min. Cajun Advanced Picosatellite Experiment by the University of Louisiana at Lafayette..
Aerocube 2 - . Mass: 1.00 kg (2.20 lb). Nation: USA. Agency: Makeyev bureau. Manufacturer: Aerospace. Class: Technology. Type: Navigation technology satellite. Spacecraft: Cubesat. USAF Sat Cat: 31122 . COSPAR: 2007-012F. Apogee: 771 km (479 mi). Perigee: 648 km (402 mi). Inclination: 98.10 deg. Period: 99.00 min. 1U cubesat for Aerospace Corporation. Failed. Solar converter malfunction on 18 April 2007..
CSTB 1 - . Mass: 1.00 kg (2.20 lb). Nation: USA. Agency: Makeyev bureau. Manufacturer: Boeing. Class: Technology. Type: Navigation technology satellite. Spacecraft: Cubesat. USAF Sat Cat: 31133 . COSPAR: 2007-012R. Apogee: 771 km (479 mi). Perigee: 648 km (402 mi). Inclination: 98.10 deg. Period: 99.00 min. CubeSat TestBed for Boeing IDS/Advanced Systems, Huntington Beach, California..
CP 3 - . Mass: 1.00 kg (2.20 lb). Nation: USA. Agency: Makeyev bureau. Manufacturer: Cal Poly. Class: Technology. Type: Navigation technology satellite. Spacecraft: Cubesat. USAF Sat Cat: 31128 . COSPAR: 2007-012M. Apogee: 793 km (492 mi). Perigee: 646 km (401 mi). Inclination: 98.10 deg. Period: 99.20 min. California Polytechnic University cubesat, the backup for CP2 lost in a Dnepr launch failure in 2006..
CP 4 - . Mass: 1.00 kg (2.20 lb). Nation: USA. Agency: Makeyev bureau. Manufacturer: Cal Poly. Class: Technology. Type: Navigation technology satellite. Spacecraft: Cubesat. USAF Sat Cat: 31132 . COSPAR: 2007-012Q. Apogee: 771 km (479 mi). Perigee: 648 km (402 mi). Inclination: 98.10 deg. Period: 99.00 min. California Polytechnic University cubesat..
Libertad - . Mass: 1.00 kg (2.20 lb). Nation: Colombia. Agency: Makeyev bureau. Manufacturer: Arboleda. Class: Technology. Type: Navigation technology satellite. Spacecraft: Cubesat. USAF Sat Cat: 31129 . COSPAR: 2007-012N. Apogee: 793 km (492 mi). Perigee: 646 km (401 mi). Inclination: 98.10 deg. Period: 99.20 min. Picosat built and operated by the Universidad Sergio Arboleda, Bogota, Colombia..
MAST - . Mass: 3.00 kg (6.60 lb). Nation: USA. Agency: Tethers. Manufacturer: Stanford. Class: Technology. Type: Tether technology satellite. Spacecraft: Cubesat. USAF Sat Cat: 31126 . COSPAR: 2007-012K. Apogee: 783 km (486 mi). Perigee: 647 km (402 mi). Inclination: 98.10 deg. Period: 99.10 min. Multi Application Survivable Tether experiment, built by Tethers Unlimited Inc and Stanford University. MAST consisted of the TED (Tether Deployer) satellite, with a 1 km deployable multi-strand Hoytether; RALPH, a small end mass satellite; and between them, GADGET, an inspector 1U cubesat which could move along the tether. Before deployment the MAST package fit into a 0.3 m x 0.1 m module. Failed to deploy, but radio contact made. 2007 June 15 - . 02:14 GMT - . Launch Site: Baikonur. Launch Complex: Baikonur LC109. Launch Pad: LC109/95. LV Family: R-36M. Launch Vehicle: Dnepr. TerraSAR-X - . Mass: 1,346 kg (2,967 lb). Nation: Germany. Agency: DLR. Manufacturer: EADS Astrium. Class: Surveillance. Type: Civilian Radarsat. Spacecraft Bus: Astrobus. Spacecraft: TerraSAR-X. USAF Sat Cat: 31698 . COSPAR: 2007-026A. Apogee: 510 km (310 mi). Perigee: 507 km (315 mi). Inclination: 97.45 deg. Period: 94.79 min. Scientific/commercial surveillance satellite. equipped with an X-band synthetic aperture radar with 1 meter resolution. 2007 June 28 - . 15:02 GMT - . Launch Site: Dombarovskiy. LV Family: R-36M. Launch Vehicle: Dnepr. Genesis 2 - . Mass: 1,360 kg (2,990 lb). Nation: USA. Agency: Makeyev bureau. Manufacturer: Bigelow. Class: Manned. Type: Manned space station. Spacecraft Bus: Bigelow. Spacecraft: Genesis Pathfinder. USAF Sat Cat: 31789 . COSPAR: 2007-028A. Apogee: 561 km (348 mi). Perigee: 556 km (345 mi). Inclination: 64.50 deg. Period: 95.80 min. One third scale version of the privately-financed Nautilus inflatable human space habitat module. The spacecraft's 22 interior and exterior cameras provided images of items and pictures carried for paying participants in Bigelow's �Fly your Stuff� program. 2008 August 29 - . 07:16 GMT - . Launch Site: Baikonur. Launch Complex: Baikonur LC109. Launch Pad: LC109/95. LV Family: R-36M. Launch Vehicle: Dnepr. Tachys - . Payload: RapidEye 1. Mass: 152 kg (335 lb). Nation: Germany. Agency: Makeyev bureau. Manufacturer: Surrey. Class: Surveillance. Type: Civilian surveillance satellite. Spacecraft: SSTL-150. USAF Sat Cat: 33312 . COSPAR: 2008-040A. Apogee: 632 km (392 mi). Perigee: 606 km (376 mi). Inclination: 98.00 deg. Period: 97.10 min. RapidEye AG of Brandenberg paid for launch of a constellation of five environmental monitoring satellites in a single launch, each with a mass of 152 kg including 12 kg of propellant. The satellites had an optical resolution of 6 meters, and were designed to provide on-demand images for agricultural storm damage assessment and support of emergency services. Mati - . Payload: RapidEye 2. Mass: 152 kg (335 lb). Nation: Germany. Agency: Makeyev bureau. Manufacturer: Surrey. Class: Surveillance. Type: Civilian surveillance satellite. Spacecraft: SSTL-150. USAF Sat Cat: 33313 . COSPAR: 2008-040B. Apogee: 654 km (406 mi). Perigee: 624 km (387 mi). Inclination: 98.00 deg. Period: 97.50 min. Choma - . Payload: RapidEye 3. Mass: 152 kg (335 lb). Nation: Germany. Agency: Makeyev bureau. Manufacturer: Surrey. Class: Surveillance. Type: Civilian surveillance satellite. Spacecraft: SSTL-150. USAF Sat Cat: 33314 . COSPAR: 2008-040C. Apogee: 631 km (392 mi). Perigee: 598 km (371 mi). Inclination: 98.00 deg. Period: 97.00 min. Choros - . Payload: RapidEye 4. Mass: 152 kg (335 lb). Nation: Germany. Agency: Makeyev bureau. Manufacturer: Surrey. Class: Surveillance. Type: Civilian surveillance satellite. Spacecraft: SSTL-150. USAF Sat Cat: 33315 . COSPAR: 2008-040D. Apogee: 639 km (397 mi). Perigee: 620 km (380 mi). Inclination: 98.00 deg. Period: 97.30 min. Trochia - . Payload: RapidEye 5. Mass: 152 kg (335 lb). Nation: Germany. Agency: Makeyev bureau. Manufacturer: Surrey. Class: Surveillance. Type: Civilian surveillance satellite. Spacecraft: SSTL-150. USAF Sat Cat: 33316 . COSPAR: 2008-040E. Apogee: 647 km (402 mi). Perigee: 623 km (387 mi). Inclination: 98.00 deg. Period: 97.40 min. 2009 July 29 - . 18:46 GMT - . Launch Site: Baikonur. Launch Complex: Baikonur LC109. LV Family: R-36M. Launch Vehicle: Dnepr. Deimos 1 - . Mass: 90 kg (198 lb). Nation: Spain. Agency: Makeyev bureau. Manufacturer: Surrey. Class: Earth. Type: Earth resources satellite. Spacecraft: MicroSat-100. USAF Sat Cat: 35681 . COSPAR: 2009-041A. Apogee: 677 km (420 mi). Perigee: 635 km (394 mi). Inclination: 98.10 deg. Period: 97.80 min. Disaster monitoring satellite, surveilling 600 km swaths in 22-meter resolution in three spectral bands. Operated by Deimos Space SL, Madrid, Spain..
Dubaisat 1 - . Mass: 190 kg (410 lb). Nation: UAE. Agency: Makeyev bureau. Class: Surveillance. Type: Civilian surveillance satellite. Spacecraft: SatRec. USAF Sat Cat: 35682 . COSPAR: 2009-041B. Apogee: 682 km (423 mi). Perigee: 666 km (413 mi). Inclination: 98.10 deg. Period: 98.20 min. Emirates Institute of Advanced Science and Technology, Dubai..
DMC 2 - . Mass: 95 kg (209 lb). Nation: UK. Agency: Makeyev bureau. Manufacturer: Surrey. Class: Earth. Type: Earth resources satellite. Spacecraft: MicroSat-100. USAF Sat Cat: 35683 . COSPAR: 2009-041C. Apogee: 677 km (420 mi). Perigee: 625 km (388 mi). Inclination: 98.10 deg. Period: 97.80 min. DMC International Imaging, Guildford, Surrey, UK..
Aprizesat 4 - . Mass: 14 kg (30 lb). Nation: Argentina. Agency: Makeyev bureau. Program: AIS. Class: Communications. Type: Communications satellite. Spacecraft: Aprizesat. USAF Sat Cat: 35684 . COSPAR: 2009-041D. Apogee: 677 km (420 mi). Perigee: 607 km (377 mi). Inclination: 98.10 deg. Period: 97.60 min. Nanosat 1B - . Mass: 22 kg (48 lb). Nation: Spain. Agency: Makeyev bureau. Class: Technology. Type: Technology satellite. Spacecraft: Nanosat. USAF Sat Cat: 35685 . COSPAR: 2009-041E. Apogee: 677 km (420 mi). Perigee: 587 km (364 mi). Inclination: 98.10 deg. Period: 97.30 min. INTA, Spain..
Aprizesat 3 - . Mass: 14 kg (30 lb). Nation: Argentina. Agency: Makeyev bureau. Program: AIS. Class: Communications. Type: Communications satellite. Spacecraft: Aprizesat. USAF Sat Cat: 35686 . COSPAR: 2009-041F. Apogee: 677 km (420 mi). Perigee: 566 km (351 mi). Inclination: 98.10 deg. Period: 97.10 min. Part of a planned constellation of 64 of small low-earth-orbit satellites for global data transmission, fixed and mobile asset tracking and monitoring built by Spacequest, Fairfax, Virginia for exactEarth. Included Automatic Identification System receiver to gather position data from ships. 2010 April 8 - . 13:57 GMT - . Launch Site: Baikonur. Launch Complex: Baikonur LC109. Launch Pad: LC109/95. LV Family: R-36M. Launch Vehicle: Dnepr. Cryosat 2 - . Mass: 720 kg (1,580 lb). Nation: Europe. Agency: Makeyev bureau. Class: Earth. Type: Climate satellite. Spacecraft: Cryosat. USAF Sat Cat: 36508 . COSPAR: 2010-013A. Apogee: 724 km (449 mi). Perigee: 713 km (443 mi). Inclination: 92.00 deg. Period: 99.20 min. Satellite carried a Ku-band radar to study the thickness of the polar ice caps. Launched to fulfill mission of Cryosat 1, which failed to reach orbit in 2005..
2010 June 15 - . 14:42 GMT - . Launch Site: Dombarovskiy. LV Family: R-36M. Launch Vehicle: Dnepr. Picard - . Mass: 100 kg (220 lb). Nation: France. Agency: Makeyev bureau. Class: Surveillance. Type: SIGINT. Spacecraft: Myriade. USAF Sat Cat: 36598 . COSPAR: 2010-028A. Apogee: 730 km (450 mi). Perigee: 725 km (450 mi). Inclination: 98.30 deg. Period: 99.30 min. Solar observation payload..
Prisma - . Mass: 140 kg (300 lb). Nation: Sweden. Agency: Makeyev bureau. Class: Technology. Type: Technology satellite. Spacecraft: Prisma. USAF Sat Cat: 36599 . COSPAR: 2010-028B. Apogee: 787 km (489 mi). Perigee: 724 km (449 mi). Inclination: 98.30 deg. Period: 99.90 min. Prototype Research Instruments and Space Mission technology Advancement satellite to test space rendezvous and formation-flight technologies. Consisted of 140 kg primary satellite and 40 kg target..
2010 June 21 - . 02:14 GMT - . Launch Site: Baikonur. Launch Complex: Baikonur LC109. LV Family: R-36M. Launch Vehicle: Dnepr. Tandem X - . Mass: 1,350 kg (2,970 lb). Nation: Germany. Agency: Makeyev bureau. Class: Surveillance. Type: Military Radarsat. Spacecraft Bus: Astrobus. Spacecraft: TerraSar-X. USAF Sat Cat: 36605 . COSPAR: 2010-030A. Apogee: 509 km (316 mi). Perigee: 507 km (315 mi). Inclination: 97.50 deg. Period: 94.80 min. Radar surveillance satellite with 1-m resolution in spotlight mode..
2010 July 31 - . LV Family: R-36M. Launch Vehicle: Dnepr. Prisma Tango - . Payload: Tango. Mass: 40 kg (88 lb). Nation: Sweden. Agency: Makeyev bureau. Class: Technology. Type: Rendezvous technology satellite. Spacecraft: Prisma. USAF Sat Cat: 36827 . COSPAR: 2010-028F. Apogee: 786 km (488 mi). Perigee: 725 km (450 mi). Inclination: 98.30 deg. Period: 99.90 min. Tango subsatellite separated from the main Prisma satellite Mango on 11 August 2010 at 17:51 GMT to begin formation flying experiments..
2011 August 17 - . 07:12 GMT - . Launch Site: Taiyuan. Launch Complex: Taiyuan LC2. LV Family: R-36M. Launch Vehicle: Dnepr. EDUSAT - . Mass: 10 kg (22 lb). Nation: Italy. Class: Technology. Type: Technology satellite. Spacecraft: EDUSAT. USAF Sat Cat: 37788 . COSPAR: 2011-044A. Apogee: 698 km (433 mi). Perigee: 639 km (397 mi). Inclination: 98.20 deg. Period: 98.10 min. Technology satellite built by the Universita di Roma la Sapienza..
Nigeriasat 2 - . Mass: 268 kg (590 lb). Nation: Nigeria. Agency: NSRDA. Manufacturer: Surrey. Class: Surveillance. Type: Military surveillance satellite. Spacecraft: SSTL-300. USAF Sat Cat: 37789 . COSPAR: 2011-044B. Apogee: 718 km (446 mi). Perigee: 693 km (430 mi). Inclination: 98.20 deg. Period: 98.90 min. Observation satellite with a 2.5-m resolution imager for Nigeria's National Space Research Development Agency..
Nigeriasat X - . Mass: 86 kg (189 lb). Nation: Nigeria. Agency: NSRDA. Manufacturer: Surrey. Class: Technology. Type: Technology satellite. Spacecraft: MicroSat-100. USAF Sat Cat: 37790 . COSPAR: 2011-044C. Apogee: 699 km (434 mi). Perigee: 656 km (407 mi). Inclination: 98.20 deg. Period: 98.30 min. Technology demonstration satellite built by Surrey Satellite with participation by Nigerian engineers..
Aprizesat 5 - . Mass: 14 kg (30 lb). Nation: USA. Program: AIS. Class: Communications. Type: Communications satellite. Spacecraft: Aprizesat. USAF Sat Cat: 37792 . COSPAR: 2011-044E. Apogee: 697 km (433 mi). Perigee: 610 km (370 mi). Inclination: 98.30 deg. Period: 97.80 min. Aprizesat 5 and 6 were built by SpaceQuest for exactEarth Ltd. Equipped with AIS (maritime Automatic Identification System) payloads for ship location tracking. The exactEarth system also included the SpaceQuest AprizeSat 3 and 4, and a payload attached to ISRO's ResourceSat-2 satellite. Aprizesat 6 - . Mass: 14 kg (30 lb). Nation: USA. Program: AIS. Class: Communications. Type: Communications satellite. Spacecraft: Aprizesat. USAF Sat Cat: 37793 . COSPAR: 2011-044F. Apogee: 698 km (433 mi). Perigee: 627 km (389 mi). Inclination: 98.30 deg. Period: 98.00 min. Part of a constellation of small LEO satellites for global fixed and mobile asset tracking. Also carried an AIS (Automatic Identification System) receiver monitor naval vessel locations..
Sich 2 - . Mass: 175 kg (385 lb). Nation: Ukraine. Class: Earth. Type: Earth resources satellite. Spacecraft: Sich. USAF Sat Cat: 37794 . COSPAR: 2011-044G. Apogee: 703 km (436 mi). Perigee: 684 km (425 mi). Inclination: 98.20 deg. Period: 98.60 min. Ukrainian remote sensing satellite built by Yuzhnoye..
BPA-2/SL-24 - . Nation: Russia. Class: Technology. Type: Technology satellite. USAF Sat Cat: 37795 . COSPAR: 2011-044H. Apogee: 1,296 km (805 mi). Perigee: 692 km (429 mi). Inclination: 98.20 deg. Period: 105.00 min. Yuzhnoye launch vehicle engineering payload which remained attached to the post-boost maneuvering upper stage after deployment of the other six satellites on the launch. 16 minutes after launch, at an altitude of 700 km, the upper stage dispensed the six satellites at two-minute intervals, then maneuvered into itself into a higher orbit. 2013 August 22 - . 14:39 GMT - . Launch Site: Dombarovskiy. Launch Pad: Yasniy Sh370/13. LV Family: R-36M. Launch Vehicle: Dnepr. Arirang-5 - . Payload: Kompsat-5. Mass: 1,400 kg (3,000 lb). Nation: Korea South. Class: Surveillance. Type: Surveillance satellite. Spacecraft Bus: T200. Spacecraft: Kompsat. USAF Sat Cat: 39227 . COSPAR: 2013-042A. Apogee: 560 km (340 mi). Perigee: 545 km (338 mi). Inclination: 97.60 deg. Period: 95.70 min. South Korea's first X-band SAR satellite..
AprizeSat-7 - . Mass: 14 kg (30 lb). Nation: USA. Class: Communications. Type: Communications satellite. Spacecraft: AprizeSat. USAF Sat Cat: 39416 . COSPAR: 2013-066A. Apogee: 650 km (400 mi). Perigee: 593 km (368 mi). Inclination: 97.78 deg. Period: 97.14 min. Communications satellites for SpaceQuest; part of a constellation of small LEO satellites for global fixed and mobile asset tracking. Also carried an AIS (Automatic Identification System) receiver monitor naval vessel locations. Dnepr rocket launched from an ICBM silo at Yasniy in Russia placed a cluster of 24 satellites in orbit on on a single launch. Although this was fewer than the ORS-3 launch the day before, if nanosats ejected later are counted, the single launch put 33 payloads in orbit. HINCube-1 - . Mass: 1.00 kg (2.20 lb). Nation: South Africa. Class: Technology. Type: Technology satellite. Spacecraft: Cubesat. USAF Sat Cat: 39417 . COSPAR: 2013-066B. Apogee: 678 km (421 mi). Perigee: 592 km (367 mi). Inclination: 97.78 deg. Period: 97.42 min. 1U cubesat from French South African Institute of Technology at the Cape Peninsula University of Technology. Mission: Space weather, technology demonstration, education and human capital development.. Successful. First South African CubeSat..
SkySat-1 - . Mass: 90 kg (198 lb). Nation: USA. Class: Surveillance. Type: Surveillance satellite. Spacecraft: Skysat. USAF Sat Cat: 39418 . COSPAR: 2013-066C. Apogee: 595 km (369 mi). Perigee: 564 km (350 mi). Inclination: 97.79 deg. Period: 96.26 min. Imaging satellite, the first for the US company Skybox..
Dubaisat-2 - . Mass: 300 kg (660 lb). Nation: UAE. Class: Surveillance. Type: Surveillance satellite. Spacecraft: SI-300. USAF Sat Cat: 39419 . COSPAR: 2013-066D. Apogee: 600 km (370 mi). Perigee: 583 km (362 mi). Inclination: 97.79 deg. Period: 96.51 min. Imaging satellite for the United Arab Emirates build by Satrec of South Korea..
OPTOS - . Mass: 4.00 kg (8.80 lb). Nation: Spain. Class: Technology. Type: Technology satellite. Spacecraft: Cubesat. USAF Sat Cat: 39420 . COSPAR: 2013-066E. Apogee: 793 km (492 mi). Perigee: 594 km (369 mi). Inclination: 97.76 deg. Period: 98.63 min. 3U cubesat from INTA of Spain..
Unisat-5 - . Mass: 19 kg (41 lb). Nation: Italy. Class: Technology. Type: Technology satellite. Spacecraft: Unisat. USAF Sat Cat: 39421 . COSPAR: 2013-066F. Apogee: 636 km (395 mi). Perigee: 592 km (367 mi). Inclination: 97.78 deg. Period: 96.97 min. Technology satellite for the University of Rome. It carried a further eight tiny satellites within it, and one of those (PUCP-Sat) carried a further nested satellite, Pocket-PUCP. Most of the subsatellites were ejected from Unisat-5 between 08:10 and 08:25 GMT on November 21. STSat-3 - . Mass: 170 kg (370 lb). Nation: Korea South. Class: Astronomy. Type: Astronomy satellite. Spacecraft: STSat. USAF Sat Cat: 39422 . COSPAR: 2013-066G. Apogee: 622 km (386 mi). Perigee: 591 km (367 mi). Inclination: 97.78 deg. Period: 96.83 min. Satellite built by KAIST of South Korea, with the MIRIS infrared astronomy experiment (an 8 cm telescope operating at 0.9-2 microns with a 4 degree field of view for spectroscopy of diffuse extended emission), as well as earth imaging and technology payloads. KHUSAT-1 - . Payload: CINEMA 2. Mass: 5.00 kg (11.00 lb). Nation: USA. Class: Science. Type: Science satellite. Spacecraft: Cubesat. USAF Sat Cat: 39424 . COSPAR: 2013-066J. Apogee: 727 km (451 mi). Perigee: 593 km (368 mi). Inclination: 97.77 deg. Period: 97.94 min. 3U cubesat from Kyung Hee University, Seoul, to join the CINEMA constellation..
AprizeSat-8 - . Mass: 14 kg (30 lb). Nation: USA. Class: Communications. Type: Communications satellite. Spacecraft: AprizeSat. USAF Sat Cat: 39425 . COSPAR: 2013-066K. Apogee: 666 km (413 mi). Perigee: 593 km (368 mi). Inclination: 97.78 deg. Period: 97.31 min. Part of a constellation of small LEO satellites for global fixed and mobile asset tracking. Also carried an AIS (Automatic Identification System) receiver monitor naval vessel locations..
KHUSAT-2 - . Payload: CINEMA 3. Mass: 5.00 kg (11.00 lb). Nation: USA. Class: Science. Type: Science satellite. Spacecraft: Cubesat. USAF Sat Cat: 39426 . COSPAR: 2013-066L. Apogee: 743 km (461 mi). Perigee: 594 km (369 mi). Inclination: 97.77 deg. Period: 98.11 min. 3U cubesat from Kyung Hee University, Seoul, to join the CINEMA constellation..
Triton 1 - . Mass: 4.00 kg (8.80 lb). Nation: UK. Class: Communications. Type: Communications satellite. Spacecraft: Cubesat. USAF Sat Cat: 39427 . COSPAR: 2013-066M. Apogee: 758 km (470 mi). Perigee: 593 km (368 mi). Inclination: 97.76 deg. Period: 98.27 min. 3U cubesat test of an AIS receiver from ISIS b.v., Netherlands..
Delfi-3nXt - . Mass: 5.00 kg (11.00 lb). Nation: Netherlands. Class: Technology. Type: Technology satellite. Spacecraft: Cubesat. USAF Sat Cat: 39428 . COSPAR: 2013-066N. Apogee: 773 km (480 mi). Perigee: 593 km (368 mi). Inclination: 97.76 deg. Period: 98.41 min. 3U cubesat from Delft University of Technology..
Dove-3 - . Mass: 5.00 kg (11.00 lb). Nation: USA. Class: Surveillance. Type: Surveillance satellite. Spacecraft: Cubesat. USAF Sat Cat: 39429 . COSPAR: 2013-066P. Apogee: 809 km (502 mi). Perigee: 593 km (368 mi). Inclination: 97.76 deg. Period: 98.80 min. 3U imaging satellite from PlanetLabs, San Francisco..
GOMX-1 - . Mass: 6.00 kg (13.20 lb). Nation: Denmark. Class: Communications. Type: Communications satellite. Spacecraft: Cubesat. USAF Sat Cat: 39430 . COSPAR: 2013-066Q. Apogee: 813 km (505 mi). Perigee: 593 km (368 mi). Inclination: 97.76 deg. Period: 98.84 min. 2U cubesat test an ADS-B air traffic control receiver, for GOMSpace, Aalborg, Denmark..
Lem - . Payload: BRITE-PL. Mass: 6.00 kg (13.20 lb). Nation: Poland. Class: Astronomy. Type: Astronomy satellite. Spacecraft: Toronto GNB. USAF Sat Cat: 39431 . COSPAR: 2013-066R. Apogee: 884 km (549 mi). Perigee: 594 km (369 mi). Inclination: 97.75 deg. Period: 99.59 min. Satellite using Toronto's GNB bus carrying the BRITE-PL astronomical photometry payload for the Polish Academy of Sciences..
ICUBE-1 - . Mass: 2.00 kg (4.40 lb). Nation: Pakistan. Class: Technology. Type: Technology satellite. Spacecraft: Cubesat. USAF Sat Cat: 39432 . COSPAR: 2013-066S. Apogee: 634 km (393 mi). Perigee: 587 km (364 mi). Inclination: 97.78 deg. Period: 96.90 min. 2U cubesat from Unisat-5 for Institute of Space Technology, Islamabad. Successful. First Pakistani cubesat..
HUMSAT-D - . Mass: 1.00 kg (2.20 lb). Nation: Spain. Class: Technology. Type: Technology satellite. Spacecraft: Cubesat. USAF Sat Cat: 39433 . COSPAR: 2013-066T. Apogee: 632 km (392 mi). Perigee: 586 km (364 mi). Inclination: 97.78 deg. Period: 96.88 min. Deployed from Unisat-5 for University of Vigo, Spain..
Dove-4 - . Mass: 5.00 kg (11.00 lb). Nation: USA. Class: Surveillance. Type: Surveillance satellite. Spacecraft: Cubesat. USAF Sat Cat: 39434 . COSPAR: 2013-066U. Apogee: 624 km (387 mi). Perigee: 581 km (361 mi). Inclination: 97.78 deg. Period: 96.75 min. 3U Earth imaging satellite, deployed from Unisat-5 for PlanetLabs..
WREN - . Mass: 0 kg (0 lb). Nation: Germany. Class: Technology. Type: Technology satellite. Spacecraft: Cubesat. USAF Sat Cat: 39435 . COSPAR: 2013-066V. Apogee: 638 km (396 mi). Perigee: 594 km (369 mi). Inclination: 97.80 deg. Period: 97.02 min. PocketQube cubesat from StaDoKo (spinoff company of the University of Aachen)..
50SAT - . Mass: 0 kg (0 lb). Nation: USA. Class: Technology. Type: Technology satellite. Spacecraft: Cubesat. Decay Date: 2018-05-19 . USAF Sat Cat: 39436 . COSPAR: 2013-066W. Apogee: 615 km (382 mi). Perigee: 580 km (360 mi). Inclination: 97.78 deg. Period: 96.63 min. AKA Eagle-2, 50DollarSat; from Morehead State University. First PocketQube cubesat; 1P size was 0.15 kg, 5 x 5 x 5cm cubes. BeakerSat-1 - . Mass: 1.00 kg (2.20 lb). Nation: USA. Class: Technology. Type: Technology satellite. Spacecraft: Cubesat. USAF Sat Cat: 39437 . COSPAR: 2013-066X. Apogee: 619 km (384 mi). Perigee: 583 km (362 mi). Inclination: 97.79 deg. Period: 96.71 min. 2.5P PocketQube, AKA Eagle-1, from Morehead State University..
VELOX-P2 - . Mass: 1.00 kg (2.20 lb). Nation: Singapore. Class: Technology. Type: Technology satellite. Spacecraft: Cubesat. USAF Sat Cat: 39438 . COSPAR: 2013-066Y. Apogee: 695 km (431 mi). Perigee: 593 km (368 mi). Inclination: 97.77 deg. Period: 97.60 min. Cubesat from Nanyang Tech University..
First-Move - . Mass: 1.00 kg (2.20 lb). Nation: Germany. Class: Technology. Type: Technology satellite. Spacecraft: Cubesat. USAF Sat Cat: 39439 . COSPAR: 2013-066Z. Apogee: 691 km (429 mi). Perigee: 591 km (367 mi). Inclination: 97.77 deg. Period: 97.54 min. Cubesat from Technical University of Munich..
Manolito - . Payload: CUBEBUG 2. Mass: 2.00 kg (4.40 lb). Nation: Argentina. Class: Technology. Type: Technology satellite. Spacecraft: Cubesat. USAF Sat Cat: 39440 . COSPAR: 2013-066AA. Apogee: 710 km (440 mi). Perigee: 593 km (368 mi). Inclination: 97.77 deg. Period: 97.76 min. 2U cubesat from Argentina..
Krysaor - . Payload: NEE-2. Mass: 1.00 kg (2.20 lb). Nation: Ecuador. Class: Technology. Type: Technology satellite. Spacecraft: Cubesat. USAF Sat Cat: 39441 . COSPAR: 2013-066AB. Apogee: 711 km (441 mi). Perigee: 593 km (368 mi). Inclination: 97.77 deg. Period: 97.77 min. Cubesat from Ecuadorian Space Agency..
PUCPSat-1 - . Mass: 1.00 kg (2.20 lb). Nation: Peru. Class: Technology. Type: Technology satellite. Spacecraft: Cubesat. USAF Sat Cat: 39442 . COSPAR: 2013-066AC. Apogee: 633 km (393 mi). Perigee: 587 km (364 mi). Inclination: 97.78 deg. Period: 96.90 min. 1U cubesat deployed from Unisat-5 for Pontifica Universidad Catolica del Peru, Lima..
QBScout-1 - . Mass: 0 kg (0 lb). Nation: USA. Class: Technology. Type: Technology satellite. Spacecraft: Cubesat. USAF Sat Cat: 39443 . COSPAR: 2013-066AD. Apogee: 630 km (390 mi). Perigee: 591 km (367 mi). Inclination: 97.78 deg. Period: 96.90 min. 2.5P PocketQube from University of Maryland/Baltimore County..
FUNcube-1 - . Mass: 1.00 kg (2.20 lb). Nation: UK. Class: Technology. Type: Technology satellite. Spacecraft: Cubesat. USAF Sat Cat: 39444 . COSPAR: 2013-066AE. Apogee: 677 km (420 mi). Perigee: 592 km (367 mi). Inclination: 97.77 deg. Period: 97.41 min. Cubesat for AMSAT-UK..
Tshepiso - . Payload: ZACUBE. Mass: 1.00 kg (2.20 lb). Nation: Norway. Class: Technology. Type: Technology satellite. Spacecraft: Cubesat. USAF Sat Cat: 39445 . COSPAR: 2013-066AF. Apogee: 677 km (420 mi). Perigee: 592 km (367 mi). Inclination: 97.77 deg. Period: 97.41 min. Cubesat from South Africa's Cape Peninsula University of Tech (CPUT)..
UWE-3 - . Mass: 1.00 kg (2.20 lb). Nation: Germany. Class: Technology. Type: Technology satellite. Spacecraft: Cubesat. USAF Sat Cat: 39446 . COSPAR: 2013-066AG. Apogee: 694 km (431 mi). Perigee: 593 km (368 mi). Inclination: 97.77 deg. Period: 97.59 min. Cubesat from University of Wurzburg..
BPA-3 - . Payload: SL-24. Nation: Russia. Class: Technology. Type: Technology satellite. USAF Sat Cat: 39448 . COSPAR: 2013-066AJ. Apogee: 1,610 km (1,000 mi). Perigee: 591 km (367 mi). Inclination: 97.67 deg. Period: 107.27 min. Yuzhnoye experiment attached to final stage of rocket..
Pocket-PUCP - . Mass: 0 kg (0 lb). Nation: USA. Class: Technology. Type: Technology satellite. Spacecraft: Cubesat. USAF Sat Cat: 39437 . COSPAR: 2013-066x. Apogee: 616 km (382 mi). Perigee: 579 km (359 mi). Inclination: 97.78 deg. Period: 96.64 min. PocketQube cubesat ejected from PUCPSat-1..
2014 June 19 - . 19:11 GMT - . Launch Site: Dombarovskiy. Launch Pad: Sh370/13. LV Family: R-36M. Launch Vehicle: Dnepr. Kazeosat 2 - . Mass: 177 kg (390 lb). Nation: Kazakhstan. Spacecraft: SSTL-150. USAF Sat Cat: 40010 . COSPAR: 2014-033A. Apogee: 637 km (395 mi). Perigee: 610 km (370 mi). Inclination: 97.98 deg. Period: 97.18 min. Kazakh medium resolution imaging satellite; had an imager with 6.5 metre resolution and a 77 km swath width..
Hodoyoshi 4 - . Mass: 64 kg (141 lb). Nation: Japan. Spacecraft: Hodoyoshi. USAF Sat Cat: 40011 . COSPAR: 2014-033B. Apogee: 651 km (404 mi). Perigee: 612 km (380 mi). Inclination: 97.98 deg. Period: 97.34 min. Experimental earth-observation satellite by the University of Toky with a 5 m ground resolution..
Unisat 6 - . Mass: 26 kg (57 lb). Nation: Italy. Spacecraft: Unisat. USAF Sat Cat: 40012 . COSPAR: 2014-033C. Apogee: 699 km (434 mi). Perigee: 613 km (380 mi). Inclination: 97.97 deg. Period: 97.86 min. Satellite by GAUSS Srl to test customer equipment and deploy four cubesats..
Deimos 2 - . Mass: 300 kg (660 lb). Nation: Spain. Spacecraft: Deimos 2. USAF Sat Cat: 40013 . COSPAR: 2014-033D. Apogee: 622 km (386 mi). Perigee: 597 km (370 mi). Inclination: 97.97 deg. Period: 96.88 min. Earth observation satellite which carried an 0.75m resolution, 12 km swath imager provided by Satrec South Korea. Total cost including launch was 60 million Euros..
Bugsat 1 - . Mass: 22 kg (48 lb). Nation: Argentina. Spacecraft: Bugsat. USAF Sat Cat: 40014 . COSPAR: 2014-033E. Apogee: 618 km (384 mi). Perigee: 568 km (352 mi). Inclination: 97.99 deg. Period: 96.54 min. Technology testbed for components for a planned constellation of earth observation satellites by Satellogic SA..
Hodoyoshi 3 - . Mass: 58 kg (127 lb). Nation: Japan. Spacecraft: Hodoyoshi. USAF Sat Cat: 40015 . COSPAR: 2014-033F. Apogee: 666 km (413 mi). Perigee: 612 km (380 mi). Inclination: 97.97 deg. Period: 97.50 min. Experimental earth-observation satellite by the University of Toky with a 40 m ground resolution..
Saudisat 4 - . Mass: 100 kg (220 lb). Nation: Saudi Arabia. Spacecraft Bus: Saudisat. Spacecraft: Saudisat 4. USAF Sat Cat: 40016 . COSPAR: 2014-033G. Apogee: 682 km (423 mi). Perigee: 613 km (380 mi). Inclination: 97.97 deg. Period: 97.67 min. Technology demonstration satellite King Abdulaziz City for Science and Technology with a joint NASA Ames payload related to gravitational reference sensors for drag-free spacecraft..
Tabletsat Aurora - . Mass: 25 kg (55 lb). Nation: Russia. Spacecraft: Tabletsat Aurora. USAF Sat Cat: 40017 . COSPAR: 2014-033H. Apogee: 619 km (384 mi). Perigee: 581 km (361 mi). Inclination: 97.98 deg. Period: 96.69 min. Technology demonstrator with an imaging payload by SPUTNIX with a panchromatic ground resolution of 15 m and 47 km swath width..
Aprizesat 9 - . Mass: 14 kg (30 lb). Nation: USA. Spacecraft: AprizeSat. USAF Sat Cat: 40018 . COSPAR: 2014-033J. Apogee: 715 km (444 mi). Perigee: 613 km (380 mi). Inclination: 97.97 deg. Period: 98.02 min. Part of a constellation of small LEO satellites for global fixed and mobile asset tracking. Also carried an AIS (Automatic Identification System) receiver monitor naval vessel locations..
Aprizesat 10 - . Mass: 14 kg (30 lb). Nation: USA. Spacecraft: AprizeSat. USAF Sat Cat: 40019 . COSPAR: 2014-033K. Apogee: 733 km (455 mi). Perigee: 613 km (380 mi). Inclination: 97.96 deg. Period: 98.21 min. Part of a constellation of small LEO satellites for global fixed and mobile asset tracking. Also carried an AIS (Automatic Identification System) receiver monitor naval vessel locations..
Duchifat 1 - . Mass: 1.00 kg (2.20 lb). Nation: Israel. Spacecraft: Cubesat. USAF Sat Cat: 40021 . COSPAR: 2014-033M. Apogee: 623 km (387 mi). Perigee: 601 km (373 mi). Inclination: 97.97 deg. Period: 96.94 min. 1U cubesat by the Herzliya Science Center..
Pace - . Mass: 3.00 kg (6.60 lb). Nation: Taiwan. Spacecraft: Cubesat. USAF Sat Cat: 40022 . COSPAR: 2014-033N. Apogee: 623 km (387 mi). Perigee: 601 km (373 mi). Inclination: 97.98 deg. Period: 96.94 min. 2U cubesat for the National Cheng Kung University..
Flock 1C 10 - . Mass: 5.00 kg (11.00 lb). Nation: USA. Spacecraft: Cubesat. USAF Sat Cat: 40023 . COSPAR: 2014-033P. Apogee: 623 km (387 mi). Perigee: 601 km (373 mi). Inclination: 97.98 deg. Period: 96.94 min. Part of a Planetary Labs constellation of over 100 3U cubesats to provide continuous optical surveillance of the earth..
Nanosat C BR1 - . Mass: 1.00 kg (2.20 lb). Nation: Brazil. Spacecraft: Cubesat. USAF Sat Cat: 40024 . COSPAR: 2014-033Q. Apogee: 623 km (387 mi). Perigee: 602 km (374 mi). Inclination: 97.98 deg. Period: 96.94 min. 1U cubesat for the Southern Regional Space Research Center..
Qb50P1 - . Mass: 2.00 kg (4.40 lb). Nation: Belgium. Spacecraft: Cubesat. USAF Sat Cat: 40025 . COSPAR: 2014-033R. Apogee: 623 km (387 mi). Perigee: 602 km (374 mi). Inclination: 97.98 deg. Period: 96.95 min. 2U cubesat; part of a constellation of 50 CubeSats built by university teams to study the llower thermosphere..
Flock 1C 7 - . Mass: 5.00 kg (11.00 lb). Nation: USA. Spacecraft: Cubesat. USAF Sat Cat: 40026 . COSPAR: 2014-033S. Apogee: 622 km (386 mi). Perigee: 602 km (374 mi). Inclination: 97.98 deg. Period: 96.94 min. Part of a Planetary Labs constellation of over 100 3U cubesats to provide continuous optical surveillance of the earth..
Flock 1C 1 - . Mass: 5.00 kg (11.00 lb). Nation: USA. Spacecraft: Cubesat. USAF Sat Cat: 40027 . COSPAR: 2014-033T. Apogee: 623 km (387 mi). Perigee: 602 km (374 mi). Inclination: 97.98 deg. Period: 96.95 min. Part of a Planetary Labs constellation of over 100 3U cubesats to provide continuous optical surveillance of the earth..
Popsat Hip 1 - . Mass: 3.00 kg (6.60 lb). Nation: Singapore. Spacecraft: Cubesat. USAF Sat Cat: 40028 . COSPAR: 2014-033U. Apogee: 625 km (388 mi). Perigee: 601 km (373 mi). Inclination: 97.98 deg. Period: 96.96 min. 3U cubesat by Microspace Rapid..
Flock 1C 2 - . Mass: 5.00 kg (11.00 lb). Nation: USA. Spacecraft: Cubesat. USAF Sat Cat: 40029 . COSPAR: 2014-033V. Apogee: 625 km (388 mi). Perigee: 602 km (374 mi). Inclination: 97.98 deg. Period: 96.97 min. Part of a Planetary Labs constellation of over 100 3U cubesats to provide continuous optical surveillance of the earth..
Dtusat 2 - . Mass: 1.00 kg (2.20 lb). Nation: Denmark. Spacecraft: Cubesat. USAF Sat Cat: 40030 . COSPAR: 2014-033W. Apogee: 624 km (387 mi). Perigee: 604 km (375 mi). Inclination: 97.97 deg. Period: 96.97 min. 1U cubesat by the Danish Technical University..
Flock 1C 4 - . Mass: 5.00 kg (11.00 lb). Nation: USA. Spacecraft: Cubesat. USAF Sat Cat: 40031 . COSPAR: 2014-033X. Apogee: 624 km (387 mi). Perigee: 601 km (373 mi). Inclination: 97.98 deg. Period: 96.95 min. Part of a Planetary Labs constellation of over 100 3U cubesats to provide continuous optical surveillance of the earth..
Qb50p2 - . Mass: 2.00 kg (4.40 lb). Nation: Belgium. Spacecraft: Cubesat. USAF Sat Cat: 40032 . COSPAR: 2014-033Y. Apogee: 624 km (387 mi). Perigee: 604 km (375 mi). Inclination: 97.98 deg. Period: 96.97 min. 2U cubesat; part of a constellation of 50 CubeSats built by university teams to study the llower thermosphere..
Flock 1C 11 - . Mass: 5.00 kg (11.00 lb). Nation: USA. Spacecraft: Cubesat. USAF Sat Cat: 40033 . COSPAR: 2014-033Z. Apogee: 624 km (387 mi). Perigee: 603 km (374 mi). Inclination: 97.98 deg. Period: 96.97 min. Part of a Planetary Labs constellation of over 100 3U cubesats to provide continuous optical surveillance of the earth..
Antelsat - . Mass: 3.00 kg (6.60 lb). Nation: Uruguay. Spacecraft: Cubesat. USAF Sat Cat: 40034 . COSPAR: 2014-033AA. Apogee: 700 km (430 mi). Perigee: 613 km (380 mi). Inclination: 97.97 deg. Period: 97.87 min. 2U cubesat by Uruguayan State Faculty of engineering; carried infrared imager and amateur radio payloads..
Flock 1C 9 - . Mass: 5.00 kg (11.00 lb). Nation: USA. Spacecraft: Cubesat. USAF Sat Cat: 40035 . COSPAR: 2014-033AB. Apogee: 624 km (387 mi). Perigee: 604 km (375 mi). Inclination: 97.98 deg. Period: 96.97 min. Part of a Planetary Labs constellation of over 100 3U cubesats to provide continuous optical surveillance of the earth..
Flock 1C 6 - . Mass: 5.00 kg (11.00 lb). Nation: USA. Spacecraft: Cubesat. USAF Sat Cat: 40036 . COSPAR: 2014-033AC. Apogee: 624 km (387 mi). Perigee: 604 km (375 mi). Inclination: 97.98 deg. Period: 96.98 min. Part of a Planetary Labs constellation of over 100 3U cubesats to provide continuous optical surveillance of the earth..
Perseus M2 - . Mass: 7.00 kg (15.40 lb). Nation: Russia. Spacecraft: Cubesat. USAF Sat Cat: 40037 . COSPAR: 2014-033AD. Apogee: 626 km (388 mi). Perigee: 603 km (374 mi). Inclination: 97.98 deg. Period: 96.99 min. 6U Cubesat by by Canopus Systems with an Automatic Identification System (AIS) receiver for tracking shipping..
Flock 1C 5 - . Mass: 5.00 kg (11.00 lb). Nation: USA. Spacecraft: Cubesat. USAF Sat Cat: 40038 . COSPAR: 2014-033AE. Apogee: 626 km (388 mi). Perigee: 602 km (374 mi). Inclination: 97.98 deg. Period: 96.98 min. Part of a Planetary Labs constellation of over 100 3U cubesats to provide continuous optical surveillance of the earth..
Perseus M1 - . Mass: 7.00 kg (15.40 lb). Nation: Russia. Spacecraft: Cubesat. USAF Sat Cat: 40039 . COSPAR: 2014-033AF. Apogee: 627 km (389 mi). Perigee: 604 km (375 mi). Inclination: 97.98 deg. Period: 97.01 min. 6U Cubesat by by Canopus Systems with an Automatic Identification System (AIS) receiver for tracking shipping..
Flock 1C 8 - . Mass: 5.00 kg (11.00 lb). Nation: USA. Spacecraft: Cubesat. USAF Sat Cat: 40040 . COSPAR: 2014-033AG. Apogee: 626 km (388 mi). Perigee: 603 km (374 mi). Inclination: 97.98 deg. Period: 96.99 min. Part of a Planetary Labs constellation of over 100 3U cubesats to provide continuous optical surveillance of the earth..
Flock 1C 3 - . Mass: 5.00 kg (11.00 lb). Nation: USA. Spacecraft: Cubesat. USAF Sat Cat: 40041 . COSPAR: 2014-033AH. Apogee: 625 km (388 mi). Perigee: 603 km (374 mi). Inclination: 97.98 deg. Period: 96.98 min. Part of a Planetary Labs constellation of over 100 3U cubesats to provide continuous optical surveillance of the earth..
Polyitan 1 - . Mass: 1.00 kg (2.20 lb). Nation: Ukraine. Spacecraft: Cubesat. USAF Sat Cat: 40042 . COSPAR: 2014-033AJ. Apogee: 628 km (390 mi). Perigee: 604 km (375 mi). Inclination: 97.98 deg. Period: 97.01 min. 1U cubesat by National Technical University of Ukraine..
Tigrisat - . Mass: 3.00 kg (6.60 lb). Nation: Iraq. Spacecraft: Cubesat. USAF Sat Cat: 40043 . COSPAR: 2014-033AK. Apogee: 698 km (433 mi). Perigee: 610 km (370 mi). Inclination: 97.97 deg. Period: 97.81 min. 3U cubesat built by Iraqi students at the La Sapienza University of Rome..
Lemur 1 - . Mass: 4.00 kg (8.80 lb). Nation: USA. Spacecraft: Cubesat. USAF Sat Cat: 40044 . COSPAR: 2014-033AL. Apogee: 697 km (433 mi). Perigee: 611 km (379 mi). Inclination: 97.97 deg. Period: 97.82 min. 3U cubesat by NanoSatisfi Inc..
Aerocube 6a - . Mass: 10 kg (22 lb). Nation: USA. Class: Technology. Type: Technology satellite. Spacecraft: Cubesat. USAF Sat Cat: 40045 . COSPAR: 2014-033AM. Apogee: 700 km (430 mi). Perigee: 613 km (380 mi). Inclination: 97.97 deg. Period: 97.87 min. Aerocube 6b - . Mass: 10 kg (22 lb). Nation: USA. Class: Technology. Type: Technology satellite. Spacecraft: Cubesat. USAF Sat Cat: 40046 . COSPAR: 2014-033AN. Apogee: 700 km (430 mi). Perigee: 613 km (380 mi). Inclination: 97.97 deg. Period: 97.87 min. 2014 November 6 - . 07:35 GMT - . Launch Site: Dombarovskiy. Launch Complex: Dombarovskiy. Launch Pad: Yasniy. LV Family: R-36M. Launch Vehicle: Dnepr. ASNARO - . Mass: 495 kg (1,091 lb). Nation: Japan. Class: Surveillance. Type: Surveillance satellite. Spacecraft: NEXTAR NX-300L. USAF Sat Cat: 40298 . COSPAR: 2014-070A. Apogee: 509 km (316 mi). Perigee: 506 km (314 mi). Inclination: 97.45 deg. Period: 94.77 min. High resolution imaging satellite developed by NEC and managed by Japan Space Systems (formerly USEF, part of the Ministry of Trade and Industry) rather than by the main Japanese space agency JAXA. The ASNARO had 0.5m resolution on a 10 km nadir swath width. Sun synchronous orbit; 1100 GMT local time of the descending node. Hodoyoshi-1 - . Mass: 50 kg (110 lb). Nation: Japan. Class: Surveillance. Type: Surveillance satellite. Spacecraft: Hodoyoshi. USAF Sat Cat: 40299 . COSPAR: 2014-070B. Apogee: 513 km (318 mi). Perigee: 496 km (308 mi). Inclination: 97.45 deg. Period: 94.70 min. Satellite of the University of Tokyo and AXELSPACE, carried an imager with 6.8m resolution and 28 km swath. Sun synchronous orbit; 1100 GMT local time of the descending node..
Kinshachi-1 - . Payload: CHUBUSAT 1. Mass: 50 kg (110 lb). Nation: Japan. Class: Surveillance. Type: Surveillance satellite. Spacecraft: ChubuSat. USAF Sat Cat: 40300 . COSPAR: 2014-070C. Apogee: 524 km (325 mi). Perigee: 496 km (308 mi). Inclination: 97.44 deg. Period: 94.82 min. Also known as also known as ChubuSat-1, a project of Nagoya and Daido universities. (The name Kinschachi refers to the golden sea-monster statues on Nagoya castle). It carries d 10m resolution, 14 km swath imager, a 130 m resolution, 7-13 micron infrared camera reported to be for atmosphere temperature profiles and space debris monitoring, and an amateur radio relay payload. Sun synchronous orbit; 1055 GMT local time of the descending node. Tsukushi - . Payload: QSAT-EOS. Mass: 49 kg (108 lb). Nation: Japan. Class: Surveillance. Type: Surveillance satellite. Spacecraft: Tsukushi. USAF Sat Cat: 40301 . COSPAR: 2014-070D. Apogee: 530 km (320 mi). Perigee: 489 km (303 mi). Inclination: 97.44 deg. Period: 94.81 min. 'Horsetail'; also called QSAT-EOS, Kyushu Satellite for Earth Observation System Demonstration. The satellite carried a CMOS camera with 4 m resolution and 7 km swath, a magnetometer and an in-situ space debris detector, as well as a deployable 3-meter kapton sail used as a drag augmentation device. Sun synchronous orbit; 1055 GMT local time of the descending node. Tsubame - . Mass: 49 kg (108 lb). Nation: Japan. Class: Astronomy. Type: X-ray astronomy satellite. Spacecraft: Tsubame. USAF Sat Cat: 40302 . COSPAR: 2014-070E. Apogee: 553 km (343 mi). Perigee: 495 km (307 mi). Inclination: 97.44 deg. Period: 95.11 min. 'Swallow', an astronomy satellite from the Tokyo Institute of Technology and carried a hard X-ray polarimeter to study the polarization of gamma ray bursts. Sun synchronous orbit; 1055 GMT local time of the descending node..
2015 March 25 - . 22:08 GMT - . Launch Site: Dombarovskiy. Launch Complex: Yasniy Sh370/13. LV Family: R-36M. Launch Vehicle: Dnepr. Arirang-3A - . Payload: KOMPSAT 3A. Mass: 800 kg (1,760 lb). Nation: Korea South. Class: Surveillance. Type: Surveillance satellite. Spacecraft Bus: T200. Spacecraft: Kompsat. USAF Sat Cat: 40536 . COSPAR: 2015-014A. Apogee: 538 km (334 mi). Perigee: 522 km (324 mi). Inclination: 97.53 deg. Period: 95.23 min. South Korean imaging satellite with submeter resolution. Sun synchronous orbit; 0130 GMT local time of the descending node..